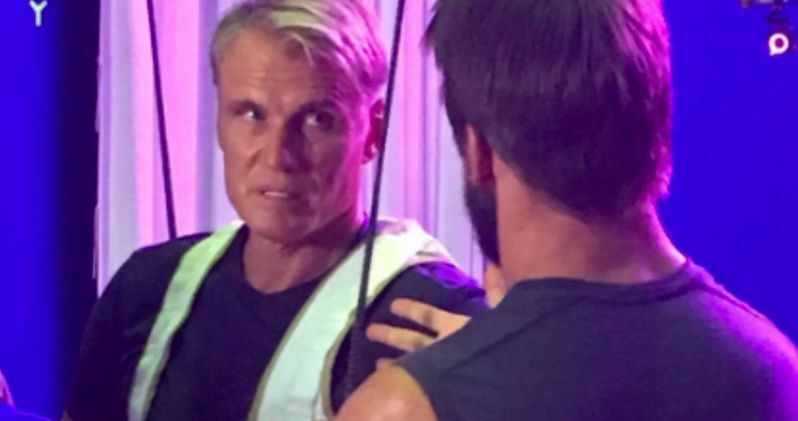 With production continuing on Aquaman from the Australia set, actor Dolph Lundgren shared a new photo and video through his social media channels. The video was posted to the actor's Snapchat, where we see Dolph on a stunt rig, practicing an underwater scene where he swims up to a certain character, portrayed in the rehearsal by an unidentified man, before pulling up and coming to a stop, coming face to face with him. The video also showcases the actor going back through the footage, to see how his movements look on camera. Unfortunately, the actor isn't in his full King Nereus costume, but hopefully we'll get our first official look at him soon. On the official Dolph Lundgren Instagram, the actor posted a photo where he's seen wearing a harness for wire work, revealing that wire work is a "good core workout." He's not in full costume here either, but perhaps these rehearsals do indicate that we're getting closer and closer to seeing him on the set in full costume. Still, even if that does happen soon, it's entirely possible that we won't get an official first look at King Nereus. Regardless, this is the first updates we've seen from the set in quite awhile, following a set photo that surfaced last month featuring the first meeting between Aquaman and Mera. The character of King Nereus is quite a recent one in the DC Comics pantheon, created by DC Films president Geoff Johns and Paul Pelletier, debuting in Aquaman Vol. 7 #19 (June 2013). This character rules an underwater kingdom known as Xebel, the homeland of Mera, who Nereus claims as his own, as he formulates plans to kill Aquaman. While it remains to be seen if this particular story line will be used in the movie, Jason Momoa teased this Aquaman movie will be based on the New 52 reboot comics, which is where King Nereus was introduced. Nereus' primary power is Hydrokinesis, allowing him to manipulate water in any way, although it remains to be seen if the movie version of Nereus will retain the same powers. The video was posted on Twitter by a user named MAHDi, who revealed that he found this video on Dolph Ludgren's Snapchat. He also refers to the Aquaman secret working title, Ahab, which was revealed back in December, long before filming actually started. Filming is expected to last throughout the summer in Australia, with another report revealing that the production has set up a fall shoot in Italy. There will reportedly be scenes filmed at Castle of Venus in Erice, on the island of Sicily, just off the coast of Italy. No details have been released about what exactly is being filmed there. While very little about the story has been revealed, director James Wan has confirmed that the DC Comics character Aqualad will not have a presence in this movie. Star Jason Momoa has described Aquaman, which hits theaters on December 21, 2018, as a "coming of age story," while director James Wan has hinted at some romantic adventure elements, comparing this story to the iconic 1980s movie Romancing the Stone, starring Michael Douglas and Kathleen Turner. While we wait for more plot details, take a look at the set video and photo for Aquaman.